Steven Spielberg and Tom Hanks team up on the big screen for the third time in The Terminal. It’s a shame being stranded in an airport is never as enjoyable as this amiable romp. Such a high-concept idea would hardly seem worthy of a two-hour movie, but that’s part of The Terminal’s out-of-left-field appeal. Viktor Navorski (Tom Hanks, Forrest Gump) is a good man from Krakozhia who wants to visit New York to complete a project in honor of his father. 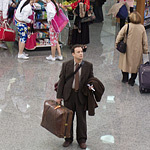 Restricted to the shopping mecca that is the modern airport by the steadfastly by-the-book airport security officer, Frank Dixon (Stanley Tucci, Road to Perdition), Viktor has no choice but to make do. And he does so for nine months. Along the way, he befriends airport personnel, serves as Cupid between a smitten young man and an immigration officer, gains employment as a construction worker, romances a flight attendant (played by none other than Catherine Zeta-Jones), and ultimately becomes a grass roots hero. The Terminal uses the airport as a microcosm of the world at large, a melting pot of people, places, and desires. Much like Schindler’s List starts with a roll call of names in honor of those murdered during the Holocaust, The Terminal starts at the immigration window, saluting the varied faces and accents that enter America’s shores. The vast majority come with good intentions and honorable hopes and dreams, but the premise provides plenty of room to bring up contemporary concerns. National security is at the top of that list. That undercurrent aside, The Terminal focuses on people, their interactions, and their inherent good. John Williams’ Gershwin-esque score suitably underpins the choreography of human interaction. In the rushed world of airport life, with people coming and going and the bartenders the only element coming close to a constant, it’s easy to come to snap judgments on people only briefly met. Take the jerk behind the wheel of the out-of-control concourse cart, for example. Then there’s the rudeness of the airport janitors and their unapologetic approach to their jobs. The whole clash of personalities is on hand in The Terminal. But, as in the real world, the key is in taking time to get to know people. And time is one thing Viktor finds he has plenty of. The scowling janitor of The Terminal, Gupta (Kumar Pallana, Bottle Rocket) is a prime example. He has his own back story, like all people do, and given the circumstances of his job, he finds what enjoyment he can, even if it is in taking delight at the pratfalls of hurried travelers as they slip and slide across Gupta’s freshly mopped floors. Even with his mean-spirited sense of humor, Gupta turns out to be a good guy. A funny guy with a heart of gold. His is just one of the many stories told at the gates of The Terminal. Spielberg is on a roll and, for a director who’s pushing 60, it’s amazing that his directing choices are only getting more exciting artistically. After all, this is the man who pioneered the summer blockbuster with Jaws and dominated the summer movie scene in the 1980s with E.T. and Indiana Jones. Then Spielberg grew up in the 1990s with a pair of unflinching war movies, Schindler’s List and Saving Private Ryan. Now, in the new millennium, he’s in the enviable position of building on a stunning library of work, mixing his panache for fantasy with more human resonance in Catch Me If You Can and meatier drama in Minority Report. With The Terminal, Spielberg returns with a movie unlike anything he has done before, although it is in the same vein as Catch Me If You Can. Both that film and The Terminal are lighthearted fare, but this latest effort is a pure confection that is best described as “charming,” an old-fashioned word unfitting for any other major summer movie since Grace Kelly left for Monaco. Also returning from Catch Me If You Can is co-writer Jeff Nathanson, who adds his talents to those of the formidable Andrew Niccol, the mind behind Gattaca and The Truman Show. Along with Sacha Gervasi, the three writers have concocted a genuinely funny story with twists and turns that ring true, mixing good humor with good heart that results in a feel-good cocktail of movie time magic.